I have a confession. I don't have a plan for blogging about the baby. This isn't supposed to be my diary or pregnancy blog, so I hesitate to put a lot out there about pregnancy. Yet, it's a huge part of our life right now, and I can't help but let it spill on to the blog. I have been taking pictures (and posted a few on IG) weekly to document my growth. I am trying to write in a journal for the baby on a weekly basis. And now, I am borrowing this idea from Molly to give an update. How I'm feeling: I was feeling great until Monday. My energy has been up for the past three weeks (all of my 2nd trimester), but I got this cold and ended up leaving work early. I went to to doctor yesterday because I was so miserable and found I have a sinus infection. Ick. Thankfully, they could give me something, so I should be back in business real soon! Sleeping: With my head propped up thanks to the sinus infection (I can't breath laying down). Food cravings: Last week, I started wanting grapefruit. I don't know if it was the power of suggestion from blog posts and IG pics showing the beautiful citrus fruit, but I have had a whole one everyday since Friday. I've been enjoying all kind of fruit and fruit flavors lately from cranberry juice to no-sugar added popsicles to blueberries on my cereal. Food aversions: Coffee, weird but true. Doctor's appointment: Next week, I am seeing the doc and have an ultrasound. We could find out the gender, but we're not going to. This is hard for the planner in me, but I think it's the right choice for our first baby. Movement: I felt him/her move for the first time on Saturday night! We were eating a big bowl of popcorn and it almost felt like my stomach was growling, but not making any noise. And yesterday morning, the baby was really active. I was sitting still and s/he kept flipping about (or so it felt). Gender/Names: We are pretty settled on a girl's name, but haven't settled on a boy's name. But since we're NOT finding out, we have about 22 more weeks to mull it over. What I'm looking forward to: I am excited about our ultrasound next week and seeing the little one move around. What I did / got for baby: Created a registry and have been diligently researching cloth diapering options and figuring out nursery decor ideas. 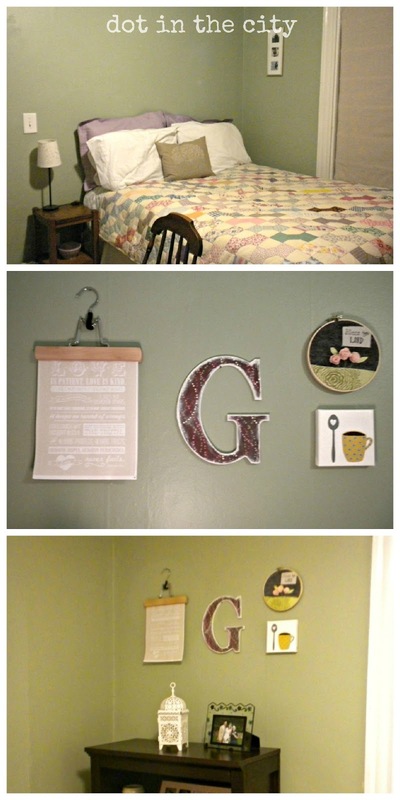 I both love and hate the challenge of gender neutral colors for the nursery, clothing and whatnot. So many things are blue or pink. What I learned this week: There are way too many choices for baby items. I've been slightly overwhelmed with putting together a baby registry and decided I need to seek out an experienced mom -friend to go through it with. 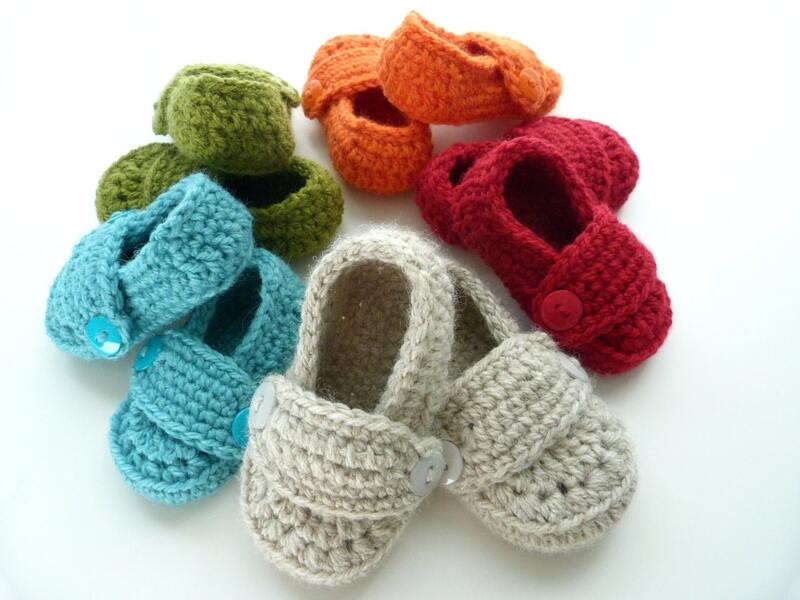 I'm talking which kinds of bottles, pacifiers, etc. 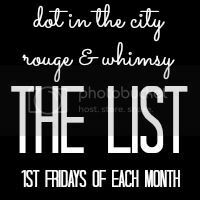 And don't forget, tomorrow we kick off The List linkup! Now that our guest room is complete, I can spend some time getting it ready for guests. Since we don't live in the same state (or even region) as our relatives, I am always excited to host an out of town visitor. It's a special occasion. Thankfully, my mother and Granny were excellent hostesses and I learned a great deal by watching them. Having grown up living in five states, I learned from an early age having out of town guests, even relatives, was event to prepare for. Provide guests with towels in their room so they know which ones they can use (see photo above). 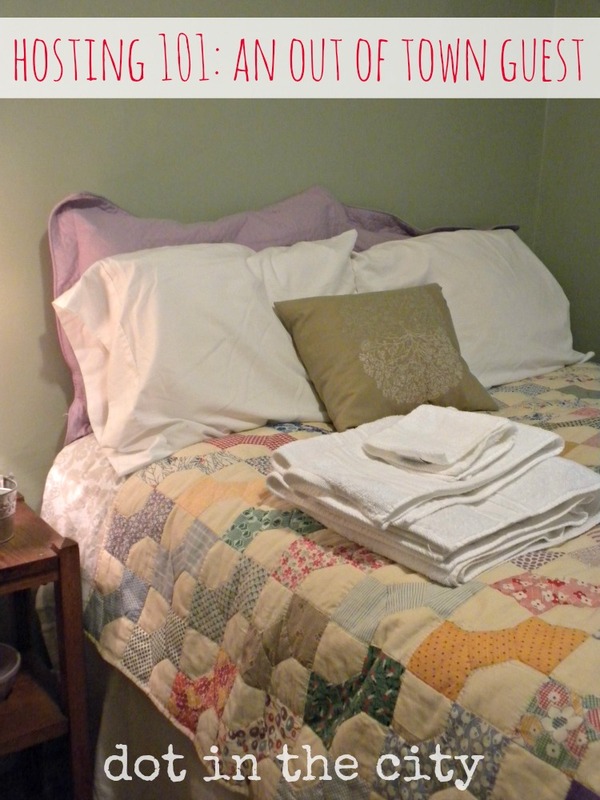 I've also let guests know about a stash of clean towels in the linen closet or bathroom, but leaving the fresh towels on the bed or nearby gives an inviting feel. 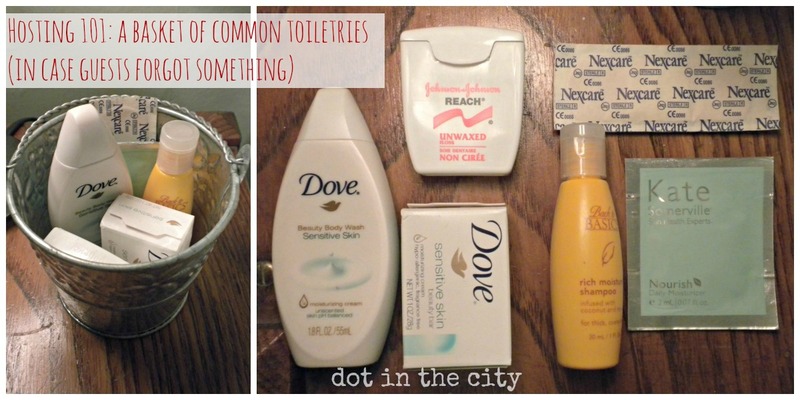 Do you collect small toiletries from samples or hotels? I love having a little stash of travel-sized toiletries I can offer guests, in case they forgot something. By leaving a little basket of toiletries, it makes guests feel welcome and they can ask for something if they forgot it. When guest are new to an area, they may be curious about local history or sites. 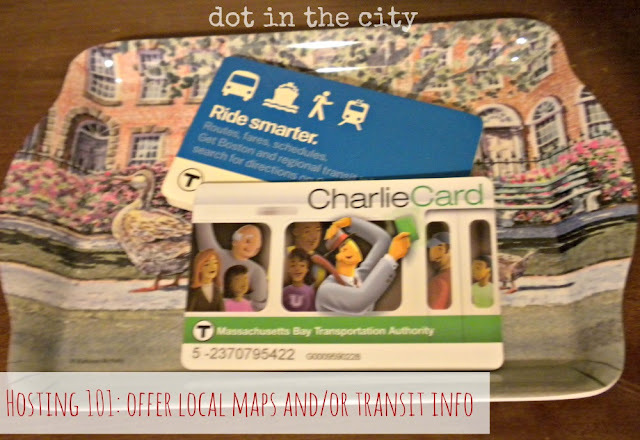 It's no secret I love Boston, and I love showing off maps and transit info in our guest room. 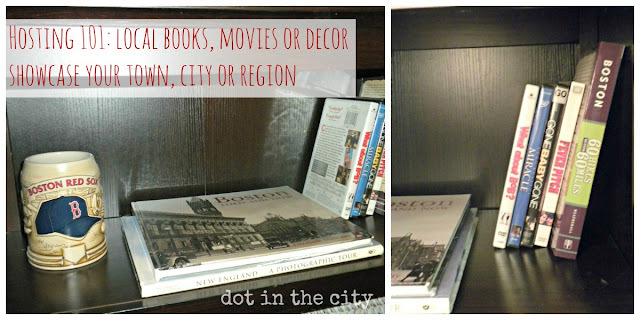 I am trying to collect a few Boston prints and other locally-inspired images to display in the room as well. On the bookshelf, I continued the theme of showcasing local flavor with books and movies set in New England. I need to work on building up our movie collection (Good Will Hunting and The Town are still on my wishlist) to feature a few more Beantown favorites. If you're not one for having your own collection of movies and books of nearby tourist destinations, you may want to pick up a few library books that your guests would enjoy. Whether, they feature local stories or something all together different, if they would appeal to the guest, it's a gesture that is sure to make him/her welcome and at home. My mom used to always pickup several western books for my grandfather from the library before he visited. There are plenty of other things you can do to make a guest feel welcome in your home. Do you have a favorite thing you do when hosting an out of town visitor on your couch or guest room? 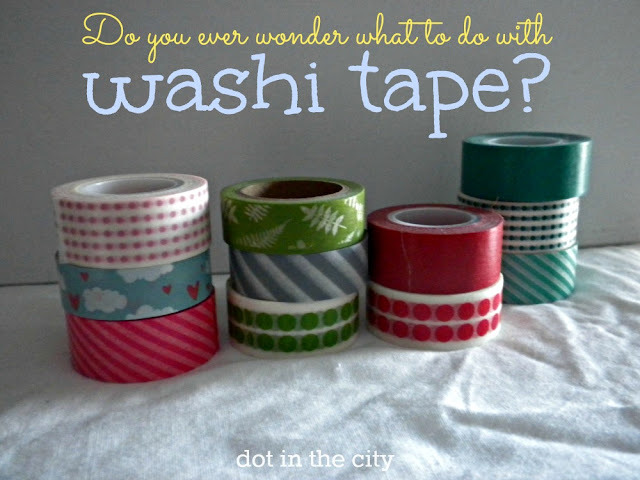 Washi tape is all the rage for crafters (and bloggers). I loved seeing the ways people used it to pretty up a notebook or card or package, but I couldn't bring myself to buy it. Finally, I found some at Target (on sale) a few months and bought it. I didn't have big intentions for it. Since then, I've slowly added to my collection and have been looking for ways to use it. What have you used your washi tape for? 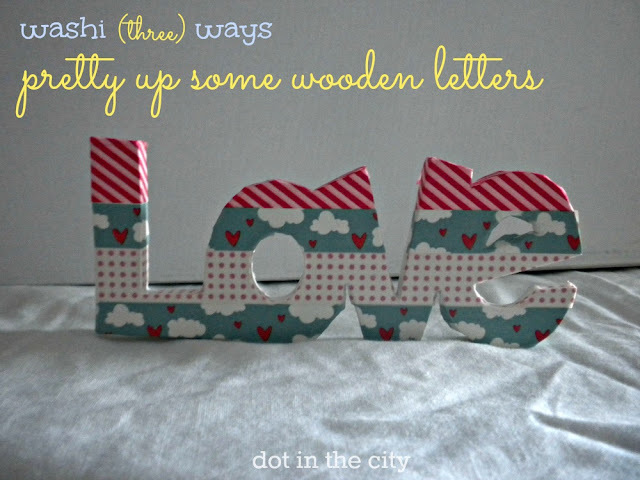 I'm linking up with Nicole for Sweet Simplicity today. Mom always called him our hero. And even though it took me years to understand why, as a two or three year old I couldn't wait for him to get home from work. When I heard the garage door open in the evening, I'd stop what I was doing and anxiously await. Once he was inside, he would start to to hum very loudly the tune to the William Tell Overture, which was really more of a "bup, bada bup, bada bup, bup, bup,bup." I knew this meant one thing: he would come into the room, scoop me up and proceed to gallop with me throughout the house as he continued the hum/sing the theme music from Bonanza. He was indeed my first hero. 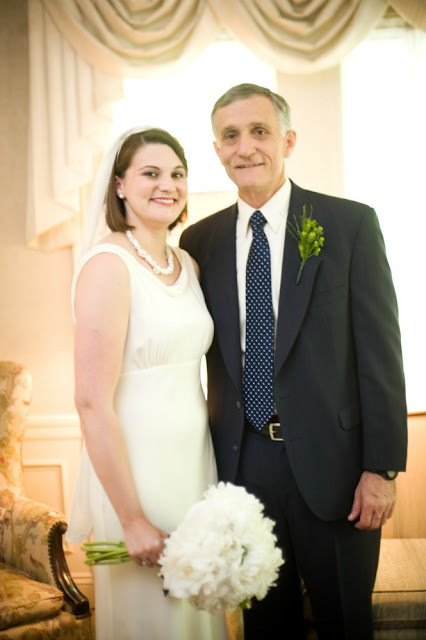 He taught me so many things like riding a bike, how to shovel snow and using file folders to keep my documents organized. He took me to the father-daughter dances with the Girls Scouts and never complained about having to dress for the 1950's or square dancing. When I think back on fond childhood memories of Dad, I can't help but get excited to see him become a grandpa this year. I'm so thankful our child will be able to look up to him too. Happy Friday! It's been a busy week here. Let's just say the day job has kept me on my toes. We've also had really cold weather all week. Today, it's supposed to be in the 20's and I'm pretty sure that's gonna feel like a heat wave ;-) As much as I despise the cold, I do love waking up to snow and this was my favorite morning view of the week. 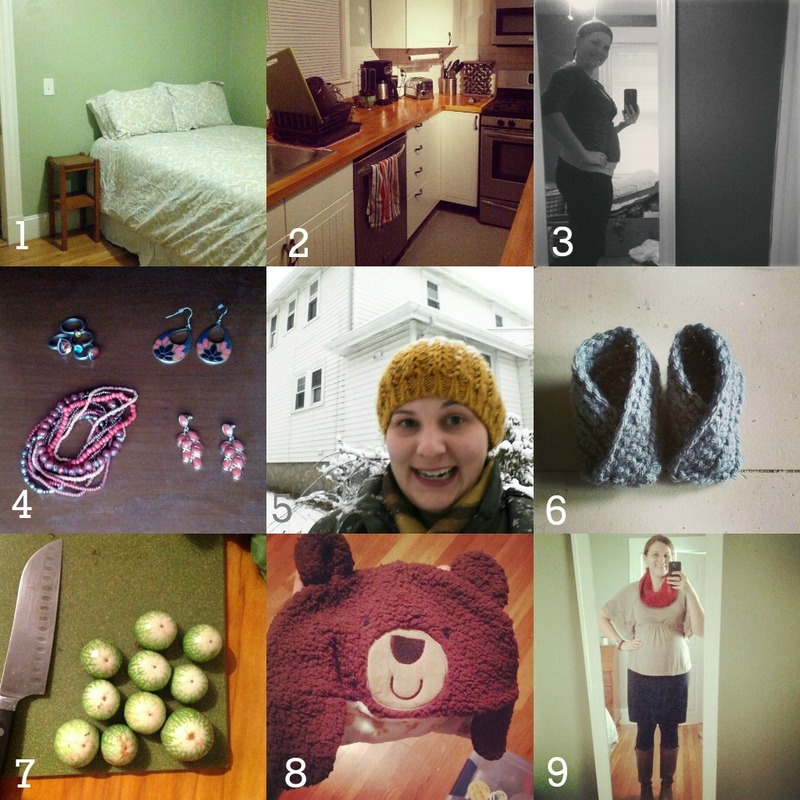 Remember when Erika and I co-hosted Friday Finds & Favorites? We decided to change it up a bit for 2013. Here's the scoop! And what better time to share our lists than at the beginning of each month? Consider it a mini New Years-- but without the confetti. The first Friday of the month we will be sharing our favorite things from the past month and what we're looking forward to in the new month. It doesn't have to be fancy, it doesn't have to be long, it can just be what the link-up is: a list. We'd love for you to join us next Friday, February 1st! Do you have a usual when you go to your favorite restaurant? If it's Mexican food, I order some kind of enchiladas and at our favorite local place the mister always orders Chile Colorado. This week, he decided to make his own version and it turned out quite well, so I thought I'd share the recipe. 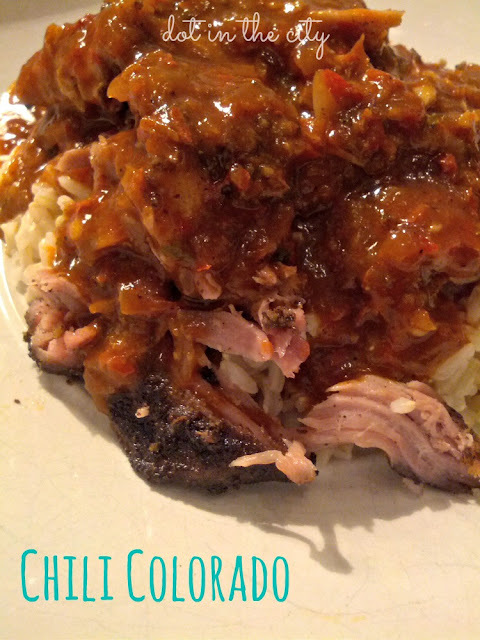 -while pork finishes cooking, or about an hour before you want to eat, begin preparing the sauce by rinsing the chilis. I've been thinking a lot about my wardrobe lately. Partially, because I can't wear a good portion of it now that I'm 16 weeks pregnant. I've also been thinking about what I want my pregnancy wardrobe to consist of as I build it. It takes me back to about eight years ago when I transitioned from student to professional. Honestly, I didn't give a lot of thought to the kinds of clothes I was buying when I was in college and grad school. I also lived in a part of the country that was pretty casual. If I wore jeans to my part-time job every day in Colorado no seemed to notice. We have a three bedroom house, but basically ignored the third bedroom for the first year we lived in our home. It became a catch-all kind of room. 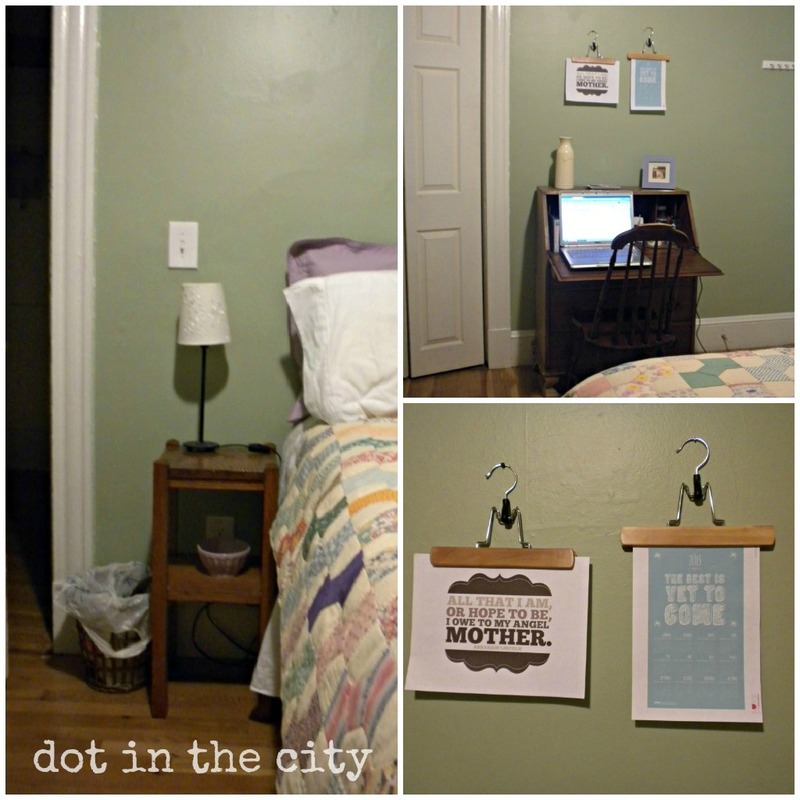 I had visions of making it an office or sewing room, but that didn't happen. Instead, we dumped the extra stuff we didn't want to think about. We pulled out the carpet last summer and were thrilled to find beautiful hardwood floors (probably the best in the whole house). However, we didn't get around to pulling out the staples until December when we decided to 'get serious' about making the room livable. We chose to make it into a permanent guest room. 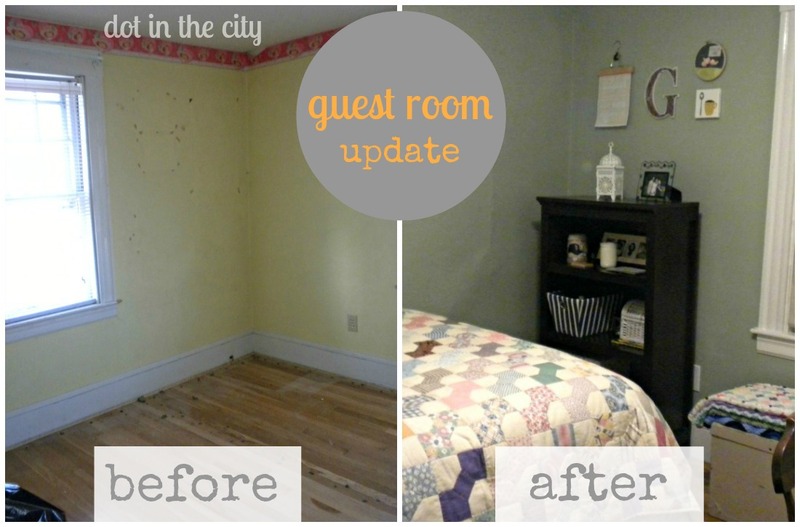 We have had a college student living in what was our guest room since September, so it seemed like a good time to makeover this space (the former guest room will be transformed into a nursery in June). And in case you can't make out the bright pink boarder that used to be in the room, I took a closeup for you. Please don't miss the sparkling light switch. 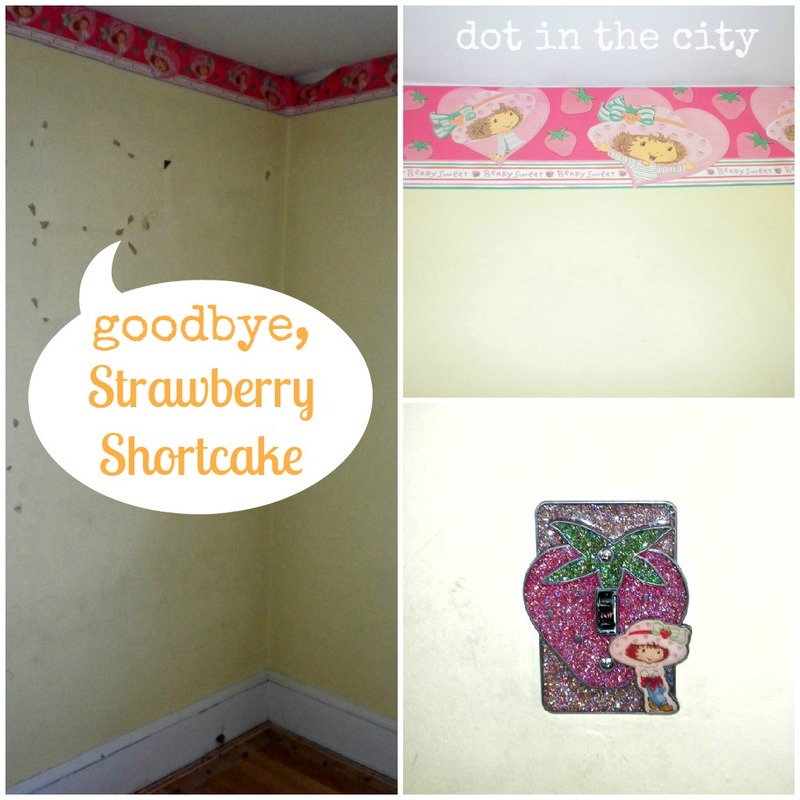 The little girl who once lived in this room must have loved Strawberry Shortcake. I have fond memories of the 1980's version of Strawberry Shortcake, but this more modern one in jeans isn't my style. As I've shared before, one of our favorite ways to save money while repainting a room, is to check The Home Depot for "oops paint." They don't often advertise this section, so you may have to poke around the paint section a bit. It's often an unlabeled shelf that contains various paint cans that have been mixed, but a mistake was made so they're marked down and priced as is. My husband picked up the green color we used in this room for $7! >>> Another tip from the mister is to get a gallon of high gloss paint rather than trim paint. The cost savings breaks down 1 gallon of high gloss is around $24 and a pint of door and trim paint runs about $20. A gallon of paint is way better than a pint. >>> The mister had another money-saving tip, rather than using low dust joint compound (42lb bucket for $14) use light weight joint compound 50lb bucket for $12) and sand with a mildly damp sponge. You'll get more light weight compound for your money and accomplish the same result. One of my other favorite details of the decor is the handmade quilt by my great grandmother from the 1970's (I think). Also, you may have seen on Instagram, we upcycled the mini blinds into Roman shades using this method I found via Pinterest. We used a drop cloth rather than fabric, to save even more money. I can't say they're my favorite, but the simple look works with the room. I'm considering painting them to add some color. If you have any questions about other items in the room, feel free to ask in the comments. I am still working to make this room a comfy space for a guest, as well as usable when we don't have a guest. I have been trying to blog from the small desk (rather than the couch). It's such a pretty room, I can't help by spend time there! Happy MLK Jr Day! I hope you are enjoying a three day weekend :) I would be if classes didn't start at the university where I work this week. Today, is my day to train staff, so it's going to be a whirlwind of a day. It's also been a pretty busy month so far. I'm thankful to have my energy back in the second trimester. 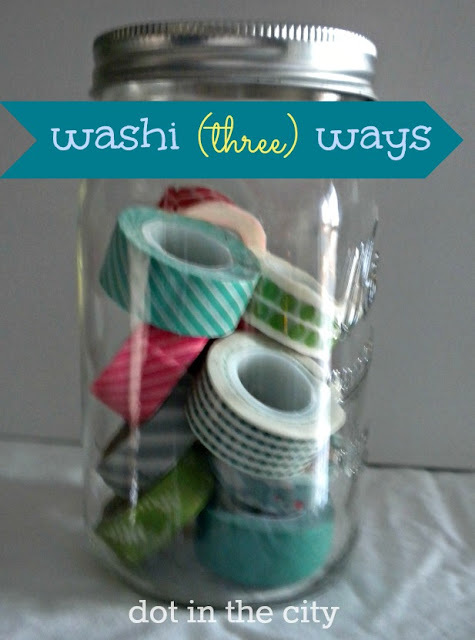 We've been tackling projects around the house left and right (and I can't wait to share more with you)! I've shown a few sneak peeks on Instagram, so feel free to follow me over there for more. 7- Thai eggplant my hubby brought home from the grocery store last week. They were so tasty! I'm linking up with Life on Leroy. The first trimester was no joke for me. I'm thankful I didn't experience a lot of morning sickness, but I did struggle with nausea and fatigue. I have never been more tired! Throughout those first thirteen weeks there were certain products I found myself using and came to rely on. 1- Wearing a little nail polish always makes me feel more pulled together and pretty and during the first thirteen weeks, I desperately wanted to feel pretty (hello bloating and fatigue!). I also noticed my nails were growing faster thanks to the hormones and prenatal vitamins. I really liked this neutral color from Zoya called Pasha. 2- I finally purchased a Bella Band when I was about eight weeks along. 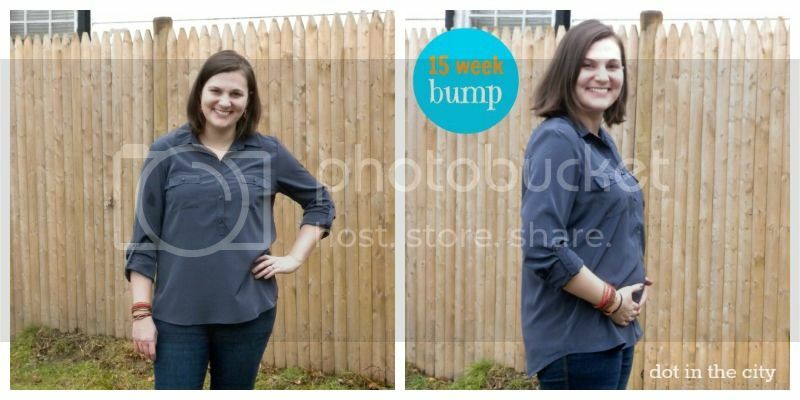 Adding it to my wardrobe made all the difference, allowing me you to wear pre-pregnacy pants unbuttoned (I didn't start wearing maternity pants until my second trimester). I got the black one, but would also consider getting a white one too. They blend well with my tank tops for a layered look. 3- I learned eating almonds helps stave off nausea because they're packed with protein. I started carrying almonds with me everywhere, so I could snack on them whenever I felt hungry. They did a great job of filling me up and avoiding bouts of nausea. Trader Joe's makes convenient packages called Just a Handful. 4- Drinking lots of water throughout pregnancy is a must and carrying a water bottle helps me consume enough water daily. I've been using Camelbak's 22 oz. Performance Bottle. The top locks avoid spills (but I don't just throw it in my purse, it would leak a small amount there). 5- I don't know if it's just the colder months (my first trimester started in October), but my skin was dryer than usual. Overnight, I used Alba's Sea Plus Renewal Night Cream on dryer parts of my face (I use my regular moisturizer with SPF during the day). I'm sure there are a few other products I used, but these are the ones I came to love. This is not a sponsored post and I'm not using affiliate links; I simply wanted to share a few products that worked well for me. Do you have anything to add? A great big thank you to those who took my annual reader survey in the last week! 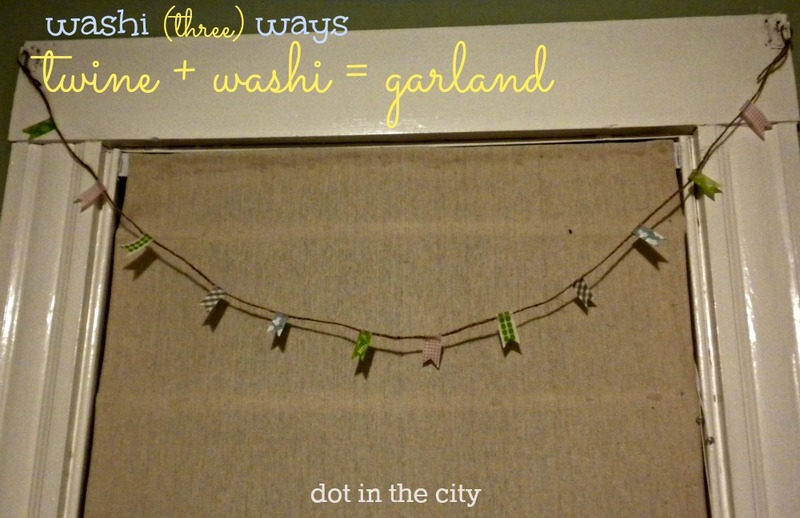 I loved reading your responses and I thought you might want a glimpse of what I learned too. What do you think?! 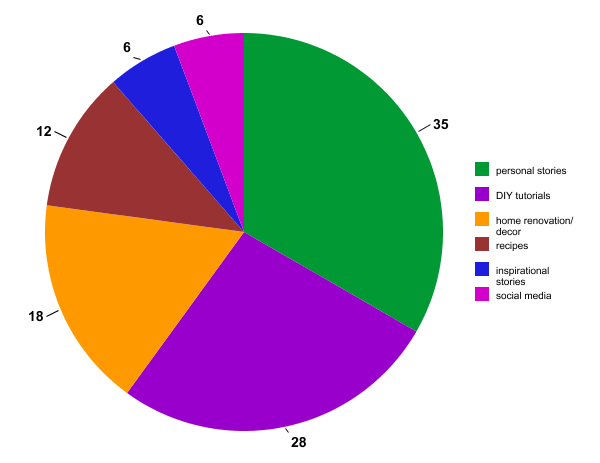 Also, just a brief warning, I got a bit nerdy and created a few pie charts along with a pie graph to use show the results. 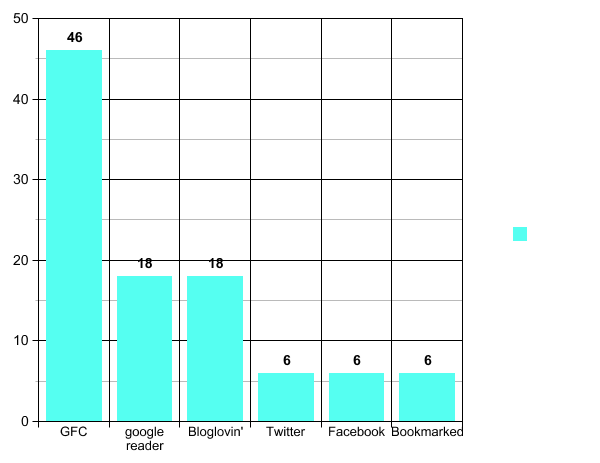 This surprised me because I feel like most of my blog friends/readers are mamma's, but I guess I was mistaken. Or maybe those blog reader mamma friends didn't have time to take the survey?! Either way, even from this sample, please understand I plan to keep this in mind as I make the transition to motherhood! I don't intend for this blog to become one focused on parenting or motherhood, though those will certainly start to influence me as my life changes. I was not surprised by this number. A lot of comments are from fellow bloggers (though I know not everyone who reads my blog leaves a comment). What topics you find most interesting? I love knowing what interests you! 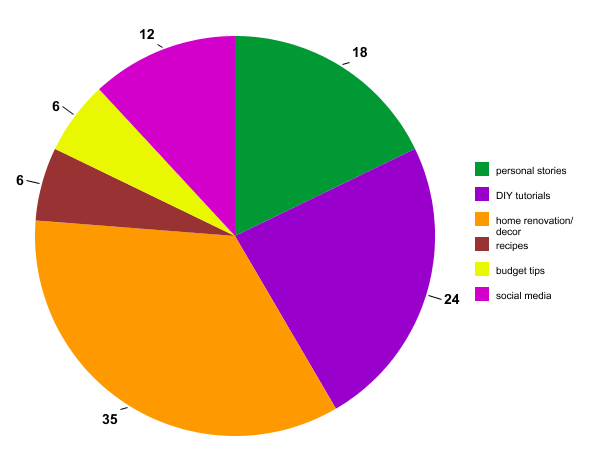 No one chose to write in any additional topics, but it seems clear that personal stories, DIY and home reno/decor are the clear favorites. That made me happy because I find those topics interesting too. What topics you like to see on this blog? I was really surprised Twitter and Facebook were tied. I always think of Twitter as my best option for spreading the word on blog posts, but it turns out Facebook is just as popular. I have way less Facebook fans, so I'm not sure it's the best comparison. Maybe I need to make an effort to increase my Facebook likes. What do you think? I also started thinking of other questions to ask, but those will have to wait until next year I guess. Or maybe I will do some smaller polls via Facebook or Twitter to get some input. Have you ever done a reader survey? What kind of results did you get? By the way, I used Learning with NCES Kids' Zone to create each of the graphs above. 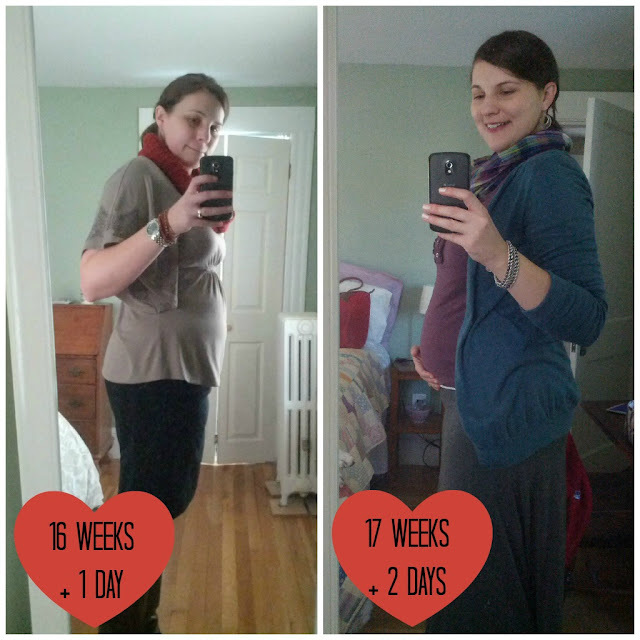 Last week, I wore my first pair of maternity pants (oh, the joys of my first pregnancy). After a day of wearing them in the office, I had come to one conclusion: I needed to acquire more pairs of maternity pants. I have been wearing the Bella Band for about a month and it's been a great companion, allowing me to wear regular jeans unbuttoned. 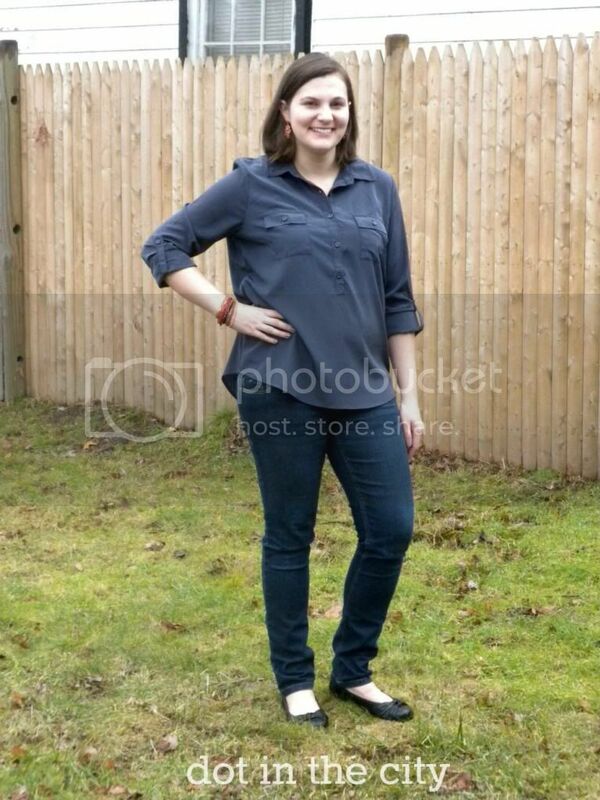 However, when I experienced the stretch of maternity pants, I knew the time had come to transition. The first pair of maternity pants I purchased from a consignment store. Unfortunately, I haven't found many other consignment shops that carry much in the way of maternity clothes. I have a limited budget for maternity clothes, so I made a list of things I hoped to buy that would be seasonless and/or classic. I hope to borrow maternity clothes from friends as well. I decided it may be best to find a pair of jeans. I did a good amount of online research before I even set foot in a store. I don't always approach shopping that way, but it seemed wise since anything I buy should be the kind of thing I plan to wear for future pregnancies. 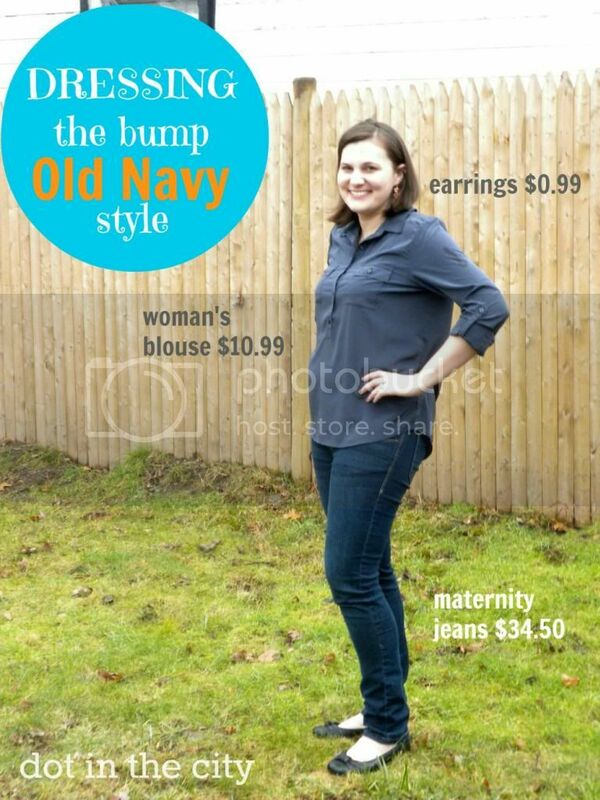 I was skeptical about Old Navy maternity pants, having read the reviews on their website. I also wanted to go to a store to try their pants/jeans on. I have long legs and regular length pants/jeans are often too short on me. So, I ventured to the mall. Despite my local Old Navy having what appeared to be a small maternity section, it had the basics and that's what I was after. I tried on the following jeans and here is a quick and honest review of each one. I don't wear boot cut jeans much anymore, but I had high hopes for them. These jeans fit, but the low-rise waist made for an exaggerated muffin top given my current state. It was not attractive, trust me. I was also concerned they would make my backside look saggy. The demi panel look like the low-rise fit on me. I could probably make the jeans work if I wore the Bella Band along with it, but again the muffin top didn't make me feel very good about my protruding tummy that is growing. I was apprehensive and somewhat intimidated to try these ones on with the huge belly panel smooth panel, but almost as soon as I put them on I knew they were the ones. The length was perfect and I often have a hard time finding jeans long enough my legs, especially at Old Navy. The denim also has a good amount of stretch to it, so I think they'll fit me for the 5-ish months ahead. To be honest, the first day I wore them, I felt like they were sliding down a bit, so the next time I wore them with my Bell Band to keep them in place. I know they will fit me for months to come! I also decided to check out the regular women's clearance rack and see if I could find a top or two that would work with my growing bump. Sure enough, I found a top I had admired months ago marked down to $10.99. It was a size larger than I usually wear, but it fit through the shoulders and gives some room for my bump! I've heard from friends, accessories are the name of the game when it comes to pregnancy. Having that in the back of my mind, I wandered over to the scarves and soon found myself by the jewelry, noticing lots of 99-cent orange stickers! If you want to feel pulled together, get some versatile accessories. I scored two pairs of earrings, a grouping of seed bead bracelets and four rings for less than $5 total! I was thrilled to find some fun accessories in colors that will work through the spring and summer months (and maybe into fall). 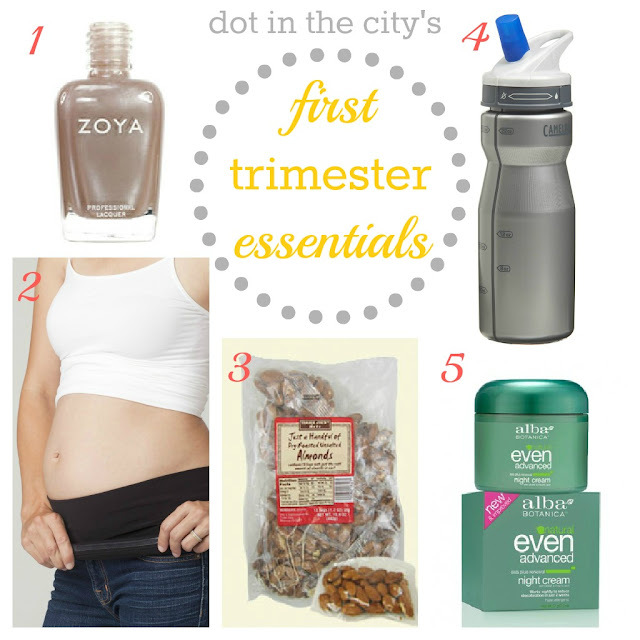 I still have a few more things on my maternity wish list, but I am feeling more comfortable and confident with these first few purchases. Do you have any tips or tricks for making regular clothes work as maternity or finding great deals on maternity clothing? I'm linking up with The Pleated Poppy today! When we first got married, I felt (self-induced) pressure to cook dinner each night. I always thought I liked to cook and was looking forward to having someone to cook for. It just so happened, the man I married also loves to cook and is actually a better cook than me. I put a lot of thought into planning our meals, feeling a sense of responsibility. I often got home around the same time as my husband and would go right to work on preparing dinner. Multiple pots would be on the stove and he'd walk in and try to help, removing one (usually the one I didn't think was ready) and putting its contents in a serving bowl. Couldn't he see that I was cooking? Didn't he know I had it under control? Cooking proved to be a source of contention during our first year of marriage. We both wanted to cook. I wanted to because I thought it was my duty as the wife. He wanted to because he found it an outlet for creativity. I'm not here to argue duty vs. creativity, but something had to give. As much as I'd heard it, I learned firsthand every couple is different and we had to find what works for our marriage. We had many conversations about cooking and who should do it. We tried to do it together, but found we were getting in each other's way, rather than doing it together. Eventually, I let go. I could see he was energized by cooking, whereas I felt drained. It was clearly a more life-giving experience for him. I had to ask myself what life-giving experiences there were for me to pursue. Not all chores are life-giving, but some are. Having clean clothes neatly folded and put away energizes me, so I do the laundry. Have you had to let go of something you thought you loved? I have a confession: I have been resisting a word of the year. 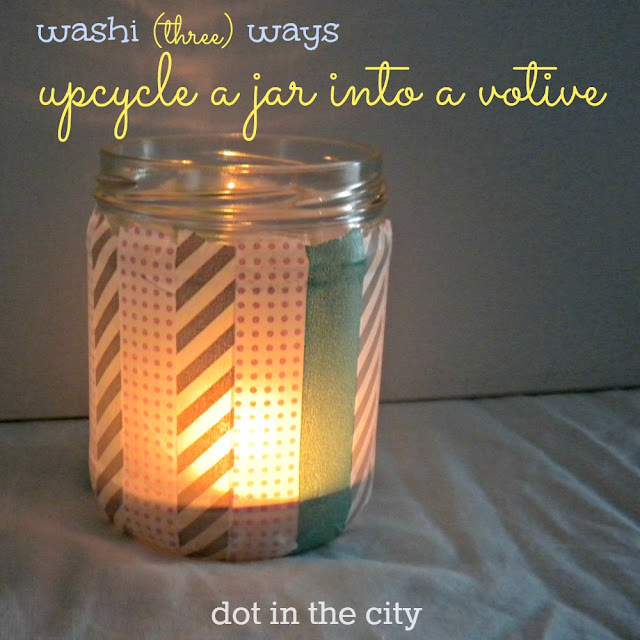 The past two years I've been blogging, I chose a word of the year. In 2011, it was give and 2012 it was ready. But I can't say either year was defined by the word I chose. I tried to be conscious of those words and that probably lasted until February or so. Honestly, I did a poor job of revisiting throughout the year. I am being more cautious in choosing a word for 2013. How do I choose a word for the year that is on course to change my life forever: I will become a parent, a mother? And that in it of itself feels like the biggest undertaking I have ever embarked on. I feel that if I choose a word for the year, it will either be one I can't live up to or one that's just not big enough. Because I have a feeling parenthood is going to be more than I can imagine. I keep telling myself I'm ready and excited to enter this next stage of life, yet there is a piece of me that is scared out of my mind! I catch myself thinking, what on earth have we done?! It's all so irreversible, which adds to the beauty and excitement I feel when I hear the word, parenthood. I was watching one of my all time favorite movies, Father of the Bride a few weeks ago and I shed more than a few tears. Even though I'm not yet a parent, there is so much emotion that runs through me as a daughter. Naturally, the movie makes me remember my own wedding day and the events leading up to it. But I also think of my dad and how long before I knew my husband's name, I watched that movie with Dad. It's such a sweet picture of a father-daughter relationship; she grows up and feels ready to move on, yet he stills thinks of her as his little girl. I'm such a sucker for those kind of movies (I just watched Trouble with the Curve last night). My heart loves to feel the tug of knowing the dad cares so much and looks out for his little girl, even when she's all grown up. And for some reason those movies tell me, I can do this parenthood thing. After all, I had parents and pretty good ones at that! I am not going to read a book that will make me into the parent I'm supposed to be, but the life I've been living for the past 32 years has prepared me to be that parent, that mother. I will make choices based on my own mistakes and things I wished I had. I will make mistakes in mothering. I may not get it right the first or second time, but that's what grace is for. Grace is my word for 2013. May I learn to be more gracious to others, as well as extend grace to myself. It isn't going to be easy; graciousness doesn't come naturally for me. Have you chosen a word of the year? If so, feel free to leave your link in the comments so I can check it out. I am so thankful for all the well wishes and congratulations from so many blog readers, Twitter and Facebook friends! Your kind words mean so much. We are beyond thrilled to be on the road to parenthood, as this little one develops. Sharing the news comes with mixed emotions. We are thrilled, yet know there are many couples who struggle with infertility and I want to be sensitive to them. I cannot imagine what it must be like. My heart aches for friends who long to be parents, and those who have experienced miscarriage(s). I want to be sensitive to others, as it seems easy to get pulled into conversations about all things baby. In addition to wanting to be sensitive, I have to be honest about my struggle with selfishness and jealousy. Throughout the months of September and October I felt like everywhere I turned someone was announcing their pregnancy news. We had started trying, but I was convinced it would be a long road. I had an ovarian cyst when I was in college and had told myself it would be a long road to conceiving for years before I was even married. 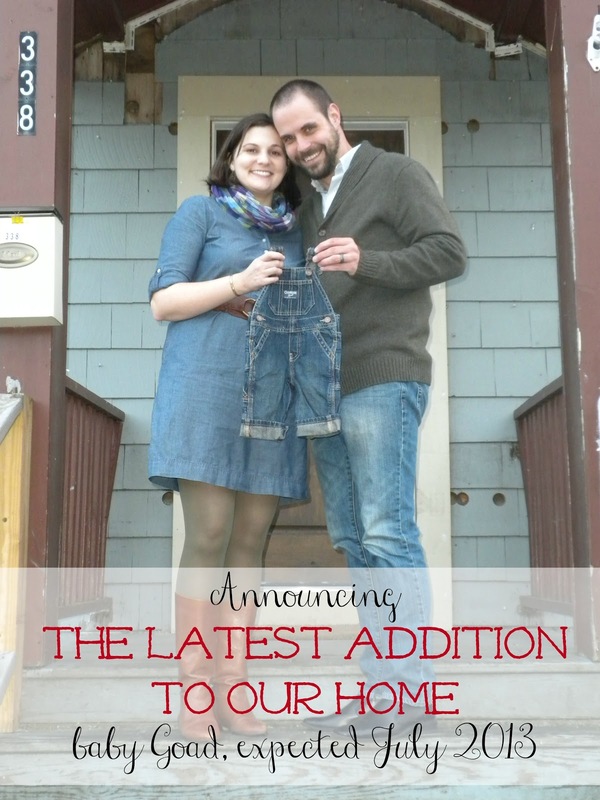 Last summer, I cried when my husband told me our neighbor was pregnant. I was thankful he told me, so it could sink in and I could express my happiness for them in person, rather than the resentment that initially bubbled up. And that was not the first time I shed tears over the news of someone's pregnancy. I was impatient and wanted it to be my turn to be the one with that news. It was pretty ugly. My cycle is like clock work, but I waited four days to take an at home pregnancy test. The previous month, I had tested negative. I didn't tell my husband when I took the test, but I summoned him to the bathroom to look at the pregnancy strip with me. We both stared in awe at the two pink lines and then got really excited! I will always remember that day. I've had a hard time keeping a secret my whole life, but this one was especially hard. About three weeks into the secret keeping, I decided to call my doctor to schedule an appointment, but I had to leave a message. The fatigue was also catching up with me. As a I drove home from work that afternoon, I felt so alone and wanted to call my mom so badly, but she passed away 11 years ago. As I sat in traffic, with tears rolling down my cheeks, the phone rang and it was the nurse calling back to schedule my first appointment. She was so happy and said all kinds of reassuring things. I breathed a huge sigh of relief. It was so helpful to be able to talk to someone about my pregnancy. Is it too late to blog about pumpkin cookies? That's right, I'm blogging about pumpkin. In January. It may seem a bit odd, but I made these cookies earlier this week and they turned out so well, I had to share! 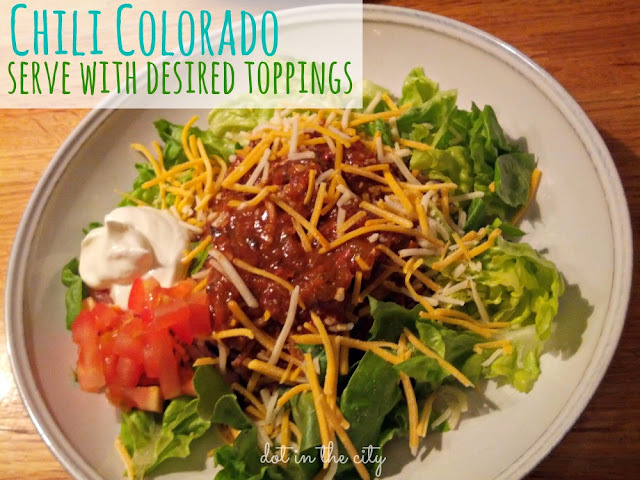 We had our annual cook off at work this week and they turned out better than I expected when I made some changes to this recipe I found via Pinterest. When I made the cookies, I used butter, whole wheat flour and almond flour. Next time, I want to use coconut oil in place of butter and cut back on the sugar (since coconut oil has a natural sweetness). 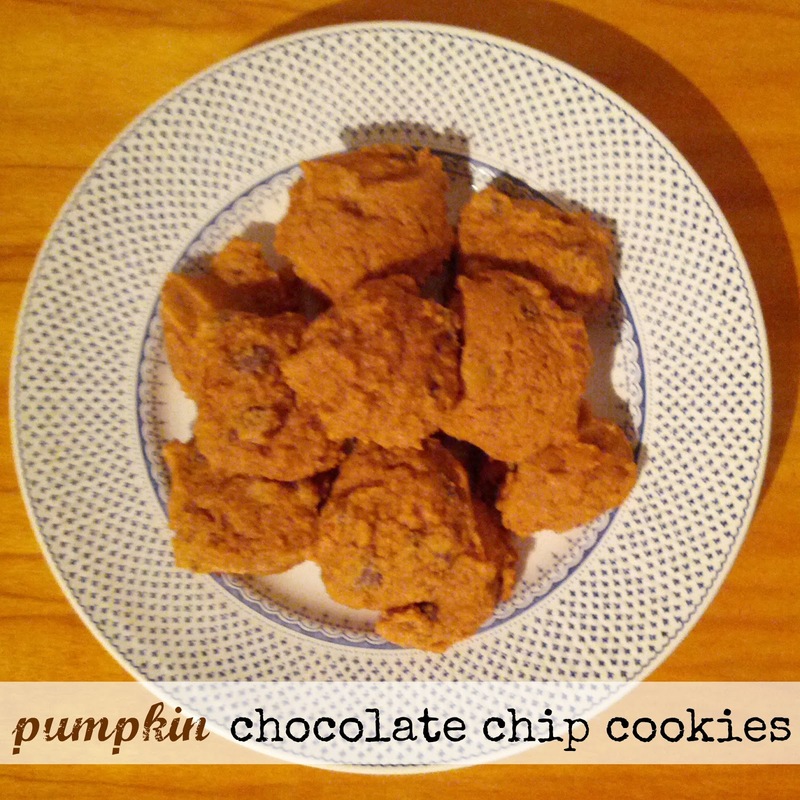 Between the pumpkin and almond flour, they were perfectly soft and chewy! Add pumpkin, eggs and vanilla; beat well. Stir together flours and next 5 dry ingredients. Add to batter; mix well. Drop rounded teaspoonfuls two inches apart on a cookie sheet. 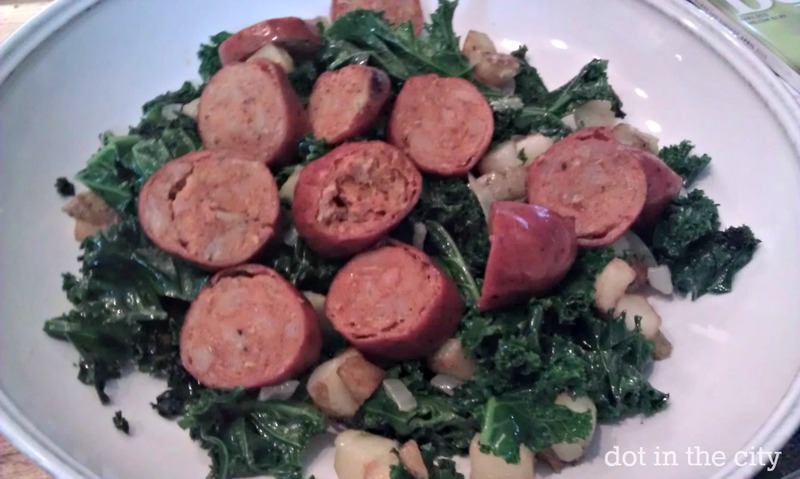 Have you experimented in the kitchen lately? Blogging for me is about community. I don't possess a certain wisdom that allows me to write, but I do like to connect with others and I've found blogging gives me an outlet for creativity and community. One way I have found it helpful to connect with readers over the years, is to ask for input. What do you want to hear? What keeps you coming back? Loading... Thank you so much! Taking two weeks off from blogging was both a relief and a challenge. 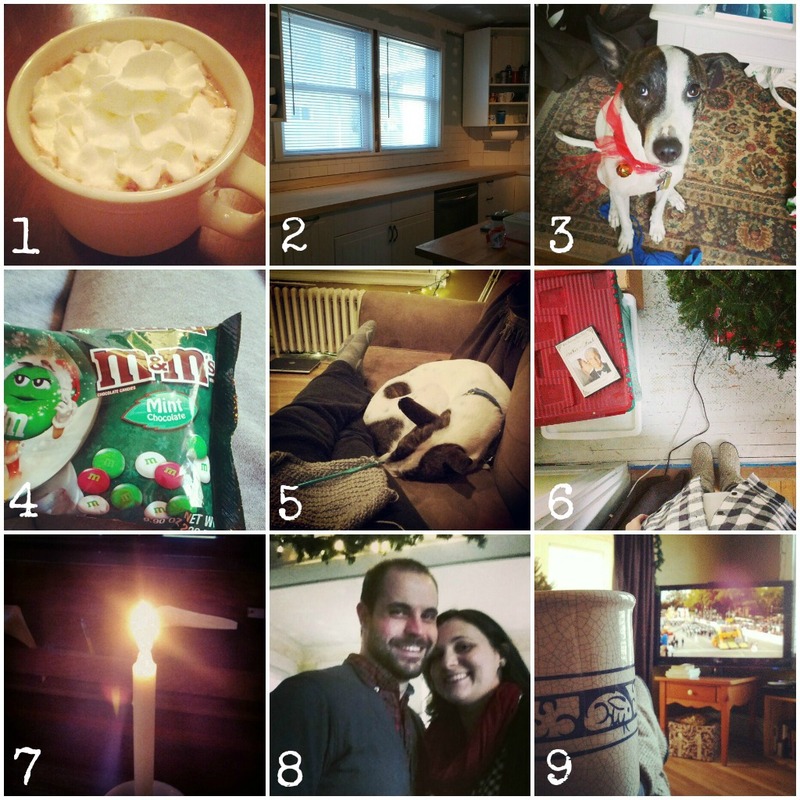 In some ways, I needed the break in my routine and I relished the chance to step back and just enjoy Christmas. I also took some time out of the office, so it was nice to scrap the daily routine and lounge in sweatpants for a few days. We stayed in town and didn't travel, which was relaxing. Christmas day was quiet and probably the most quiet we will have for years to come, as it was our last (God willing), just the two of us. It's crazy to think next year, we'll have a six month old baby! As we drove to Christmas Eve service, I said "this will likely be out last quiet Christmas for the next twenty years" and my husband replied "how about the rest of our lives." Oh, to think how life will change (and I don't even know the half of it)! Such breaks from routine are good for the soul. I spent some time to considering blogging. I didn't make any resolutions per say, but I did reflect on my purpose and set some goals for 2013. In the coming week, I'll be posting a reader survey to get your insights. How did you spend your Christmas and New Year's? Did you take a blog or any other kind of break? The title may be a bit deceiving if you haven't been reading my blog for long, but it's better late than never to share our Christmas card with y'all! We are so excited to let you in our "secret!" It's such a blessing to anticipate the arrival of "baby G" in early July! In the coming weeks, I will certainly write more about how we found out and my first pregnancy. In a nutshell, I can say the journey has been different from what I expected, but I have been blessed with few bouts of sickness/nausea. Fatigue was the most difficult symptom for me, especially between Thanksgiving and Christmas, an already packed season. I practiced the art of saying no more than usual, took naps/went to bed early and wrote fewer blog posts! In all seriousness, we have been hard at work on our house with some renovation updates over the past few weeks. I'll be sharing some before and after photos, along with money-saving ways we improved the kitchen counters and made over our guest room.